Remember when I shared some Santa Hat Hot Cocoa Brownies with you. Before Thanksgiving. And I received a little flack for that. Several people thought I jumped the gun a bit. Not that anyone minded me sharing Eggnog Muffins, Chocolate Peppermint Cheesecake or Gingerbread Rice Krispie Treats. But the santa hats I think were uncalled for in some of your minds. That’s okay. I get it. You don’t pull out your Christmas decorations the day after Halloween. And have nutcrackers hanging out on your mantle with your “Give Thanks” garland. Understandable. So here’s what I’m going to do. Today. 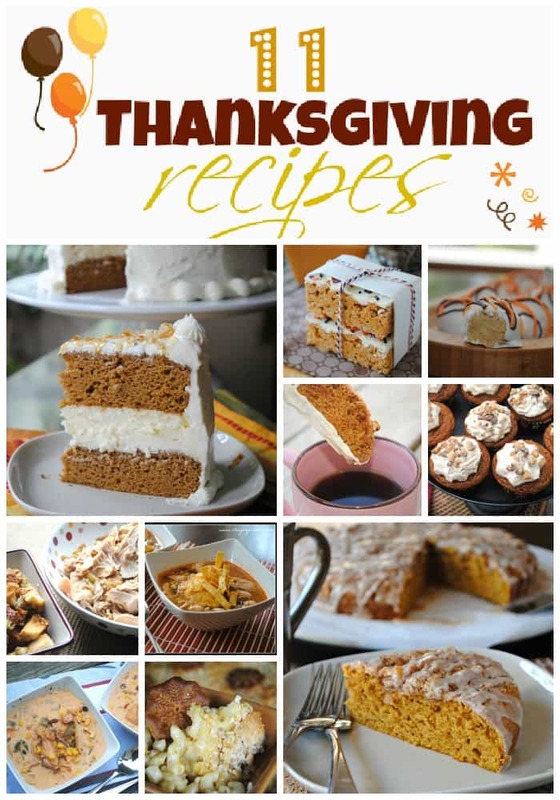 AND, as a special bonus, I will do a little Thanksgiving round up with some of my favorite recipes! I know. I’m a giver. Seriously though, have a very Happy Thanksgiving! And if you aren’t from the US, just give your friends and family a hug on Thursday and remember to be thankful for everything! Even the small things, like cookie cakes. Pumpkin Cheesecake Cake– try a new twist this Thanksgiving. Two layer of spicy pumpkin cake with a middle layer of creamy cheesecake. Frosted with cream cheese frosting, caramel and walnuts! Pumpkin Spice Rice Krispie Treats– a fun and easy kid friendly treat, for the non pumpkin pie lovers! Pumpkin Pie Truffles– how about just a bite of pie, in truffle form? Yep, then you will LOVE these! 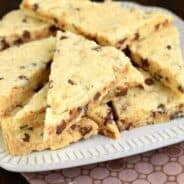 Pumpkin Spiced Biscotti– perfect with a cup of coffee while looking over the sale ads for Black Friday! Pumpkin Cupcakes with Maple and Toffee Frosting– these are just lovely. Trust me. Slow Cooker Turkey and Stuffing– have a smaller family? Buy some turkey breasts and make this delicious (AND EASY) turkey and stuffing in your slow cooker! Or, if you’re like me, and you will be traveling, this is a great way to enjoy turkey after Thanksgiving (without cooking a whole bird)! Slow Cooker Enchilada Soup– Originally calls for chicken, but leftover turkey is a PERFECT substitute in this hearty soup! Slow Cooker Turkey Taco Soup– using your leftover turkey, this is another great soup recipe! Best EVER Macaroni and Cheese– our family’s favorite homemade mac and cheese…kid and adult friendly! Pumpkin Coffee Cake with Cinnamon Streusel– why not start Thanksgiving morning on the right foot? 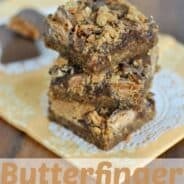 Your friends and family will love this! 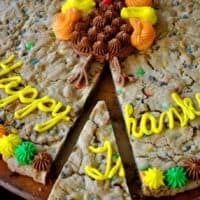 Thanksgiving Cookie Cake– what a better way to celebrate than with a GIANT chocolate chip cookie! For the cookie, preheat oven to 375 degrees. Lay a large piece of parchment paper over a 15 inch round cookie sheet (I used stoneware). Set aside. In mixer, beat Crisco with milk, vanilla and brown sugar until creamy. Add egg. Slowly mix in flour, salt, baking soda, cinnamon and nutmeg. Fold in chocolate chips and m&m's. Press cookie dough onto baking sheet, leaving at least 1 1/2 inches from edge of pan. Bake for 20-24 minutes. 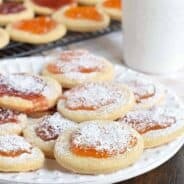 Remove and allow to set, cooling completely before frosting. For the frosting, beat butter with powdered sugar, water, vanilla and meringue powder for 3-5 minutes until fluffy. Using gel food coloring, divide frosting into small bowls and tint to desired color. Pipe onto cookie! ENJOY! This is SO adorable! And I super love those cookie cakes. I remember as a kid I always wanted one of those more than a regular cake because hello, giant cookies are the bees knees 🙂 Happy Thanksgiving to you and your family!! SO CUTE! Love all the Thanksgiving-ness! Happy TG and what a cute cookie cake! GREAT decorating, Aimee! You are such an artist! Seriously – your cupcakes and decorating skills always impress! 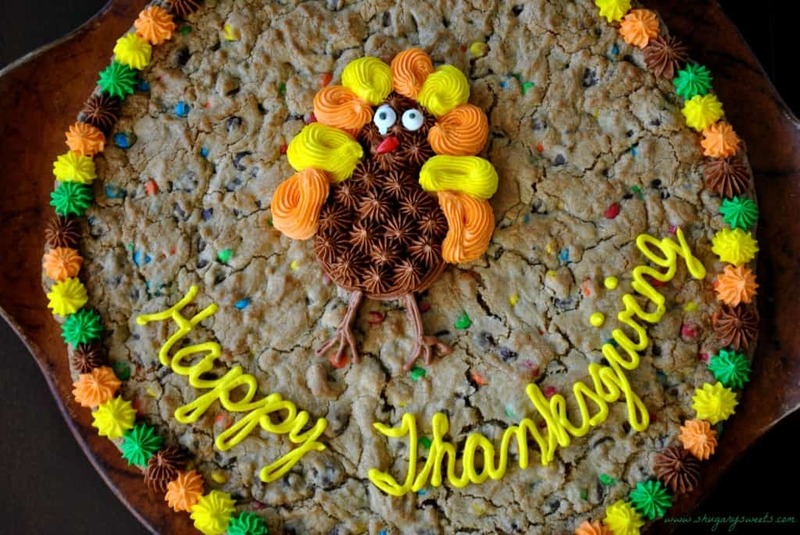 Love this idea for a homemade cookie cake! My dad likes these a lot, but I’ve never made you myself. Have a Happy Thanksgiving with you family! That is so super cute Aimee! And I loved the Santa Hats, even before Thanksgiving. 🙂 Have a wonderful holiday! Happy Thanksgiving, Shugarman’s, from The Baxter’s! I’m going to *try* the giant cookie! I think the girls will love it! Thank you Michelle! I hope you have a wonderful holiday too!!! Oh! PS – The Santa Hats are ADORBS! oh how freaking CUTE is this cookie cake?? I can’t be trusted around cookie pies/cakes. I can never ever stop slicing off little slivers for myself. truly addicting! Hope you had a wonderful thanksgiving Aimee! I can’t wait to check out the other recipes! Aimee, I made this cookie cake yesterday and it is wonderful! It was super easy and soft too! I just took a can of frosting and spread it around the cookie and then put sprinkles on top of that. It was simple but still pretty. Thanks for a great recipe! Kathy, I’m so glad you tried it, and let me know!! 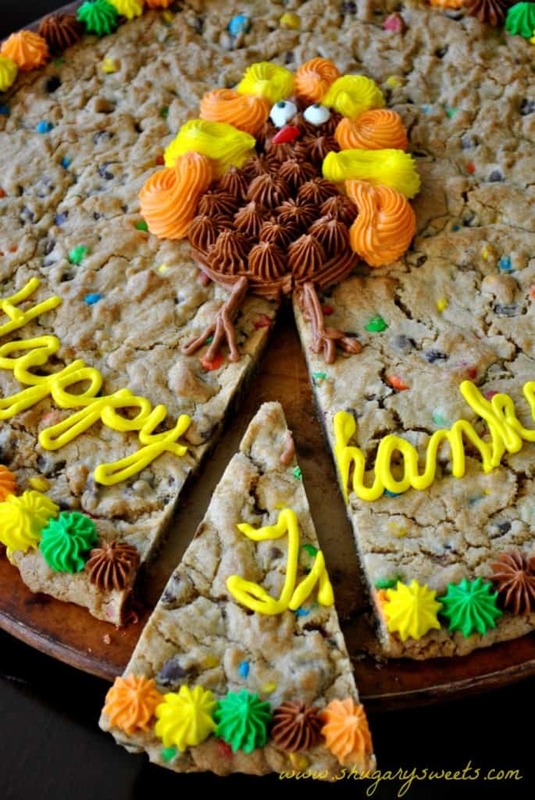 We make that big cookie cake for all holidays and birthdays. It’a fun treat for everyone. And it really goes a long way too!